“Hartley’s Butterfly” is an auto-figure that is manually applied to the chart and has the characteristic shape of two “wings.” The pattern got its name from its inventor, who, based on the mathematical Fibonacci sequence, discovered a unique digital section. Harold Hartley was also engaged in teaching activities, and he published books on earning on the stock exchange and was engaged in research activities as well. We will not go into the mathematical nuances of building this pattern, instead we will immediately proceed to the instructions for using this tool. It is only possible to trade using this figure in certain market conditions when the price is moving in the butterfly pattern. One maximum point should be observed on the chart, after which correction will take place, and then new growth will begin. It is difficult to describe this in words, so for clarity, let’s look at an example on a real chart. 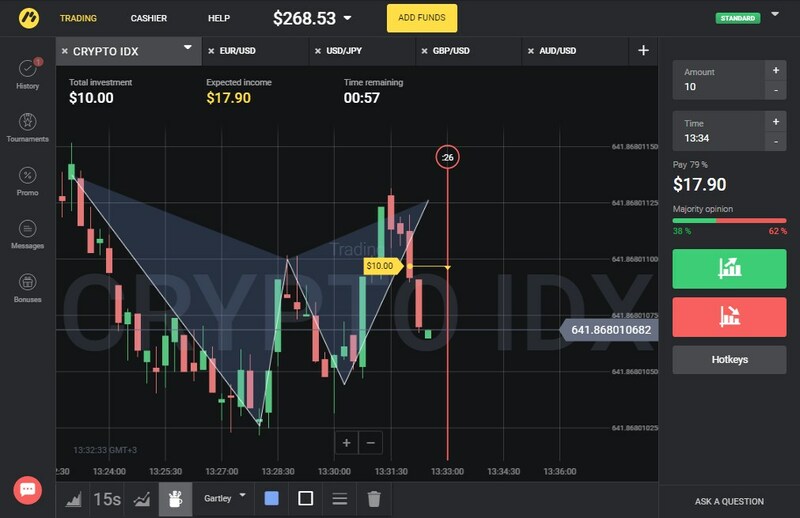 To add the pattern to the chart, you need to select the tool called “Hartley” on the trading platform. This tool is used in the same way as the broken line. The order is indicated in the picture above with green arrows. After adding the first line on the chart, levels marked in green will appear. Local price extremes should definitely be within the allocated area. 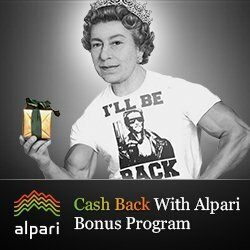 If this is not the case, then the current market conditions will not allow for the use of this tool. 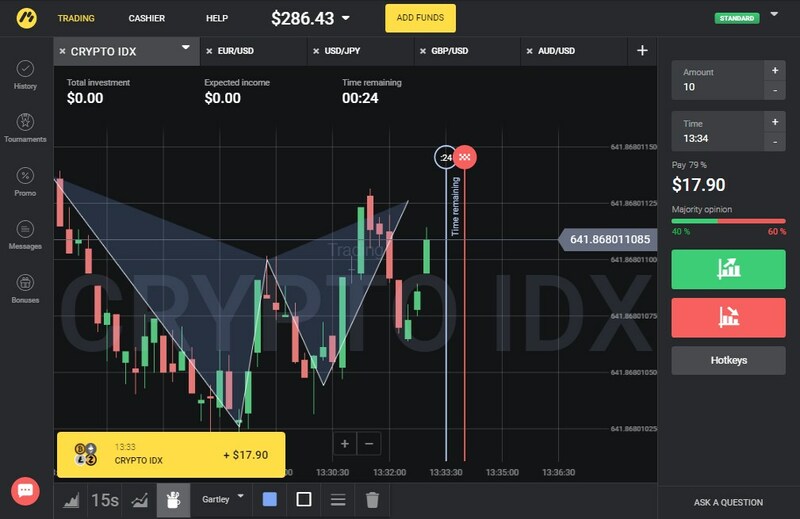 The “Hartley Butterfly” allows you to predict the behavior of the price on the last peak of movement. The rules are simple. The main idea is that the price reverses in the area of the boundaries of the pattern. Therefore, you should enter the market at the moment when the price begins to rebound from the bottom corner of the last “wing” of the figure. In the picture below, this moment is indicated by a yellow pointer. 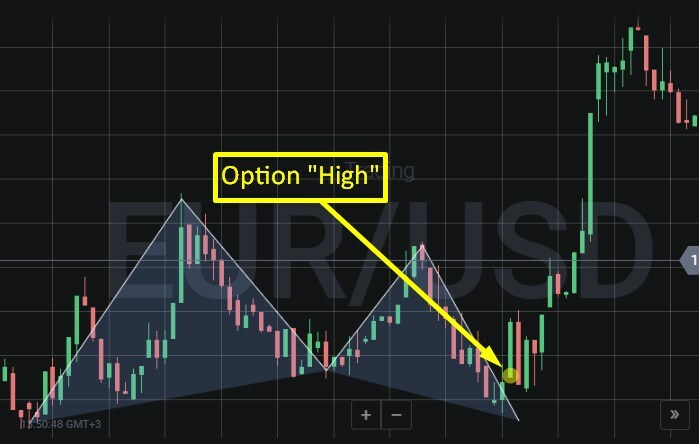 The option was purchased after it became obvious that the market was preparing to go up – on the chart there were several rising candlesticks in a row. Price movement trends are of primary importance, and not just their specific positions on the chart. That’s because moments when “Hartley” can be superimposed on the chart are not very common. But the main requirement is that the general outlines of price fluctuations fit into the pattern and have a similar shape. The rules are absolutely identical, but trading is conducted on the peak of an uptrend. Therefore, the pattern has a corresponding direction on the chart. The moment to enter the market is shown on the chart below. 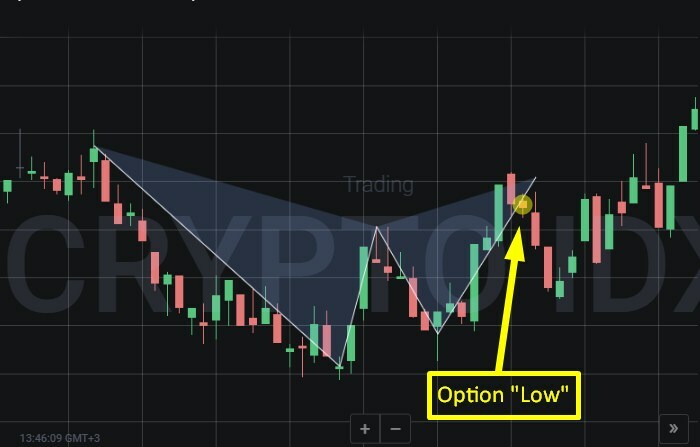 The picture is similar – the appearance of a series of descending candles located on the peak of the pattern suggest that price reversal has begun. Also there is a banal rebound of prices from the resistance level, located in the area of the first price maximum. 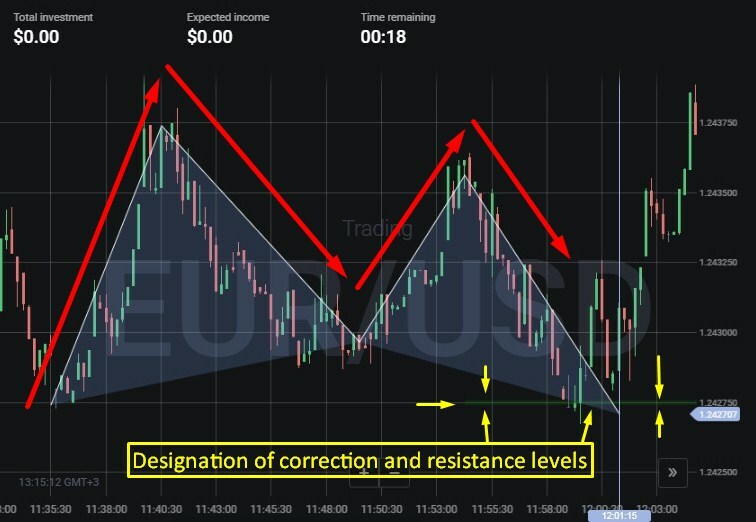 And when trading the trader should always take into account the set of signals they receive in various ways, including with the help of visual analysis of the candlestick chart. At first glance, this instrument may seem too complicated, especially when compared to conventional trend lines or channels. However, a little practice will be enough to make everything clear. For this purpose, we will look at a representative example of a Hartley trade under real conditions. So, first we will add this pattern to the trading terminal. As can be seen in the picture above, the price is preparing for a reversal. But we will wait for confirmation. After passing the peak, we purchased the option on a decrease. A picture was taken 28 seconds before the transaction was closed. As predicted, the price took a big rebound downwards. We could have purchased the option “Down” later as well, after the appearance of two downward candlesticks in a row. This is exactly what beginners should do until they have really established a “feel” for the market, which comes with experience. After a minute, the transaction is successfully closed with a profit. We traded on a 15-second interval. This is the minimum allowable time frame. However, it is recommended to use 1-minute charts. This will reduce the number of available signals, but it will improve their accuracy.